After years of relative political idleness, the young people of Uganda are regularly plotting symbolic pranks that frustrate a long-standing regime. Uganda is the world’s youngest country with a median age of 15 years. It’s also the African country with the highest rate of youth unemployment. Perhaps it should come as no surprise, then, that the push for widespread social change in Uganda is coming from young people. Last week, on Feb. 16, the Jobless Brotherhood, a group of recent university graduates, released yellow-painted pigs in downtown Kampala, Uganda’s capital city, briefly bringing business to a halt. While each of the pigs had been painted yellow to mock the party colors of the ruling National Resistance Movement, one wore a hat resembling the iconic hat of President Yoweri Museveni, who has been in power for 29 years. This wasn’t the first time yellow painted pigs appeared in town — that was on July 17, 2014, when they were sent running through the Parliamentary building. Jobless Brotherhood members Tumuhimbise Norman and Mayanja Robert spent several months planning the action, which required penetrating Parliament’s security system. 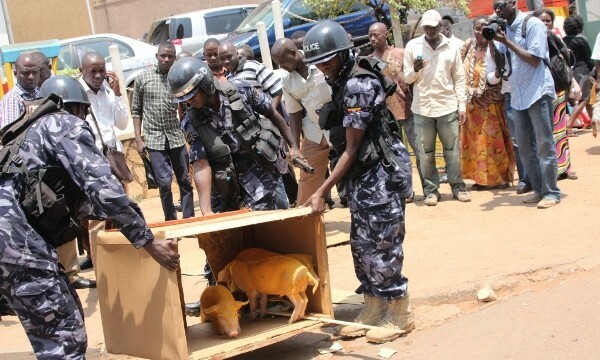 Members of Parliament watched the pigs, donning their party’s colors, traverse the halls until police arrived to capture them and their owners, who were eventually detained for more than 48 hours, a violation of Uganda’s Constitution. Youth activists like Tumuhimbise and Mayanja, who belong to opposition parties such as the Forum for Democratic Change or the Uganda Peoples Congress, aren’t the only ones who are fed up with Uganda’s government. Many youths within the ruling NRM party are speaking out as well, designing humorous demonstrations of their own that target the political elite — the majority of whom are males above the age of 50. Last month, NRM youths demanding that the government fill more positions with people under the age of 35 brought a box of baby chickens to give to President Museveni as part of his “retirement package,” insisting that the time had come for him to turn power over to the next generation of leaders. In Uganda, it is customary for retirees to be gifted with farm animals that will help them generate some income in their old age. Threatened by the symbolic message, police in full riot gear forcefully arrested the youths involved in the action. 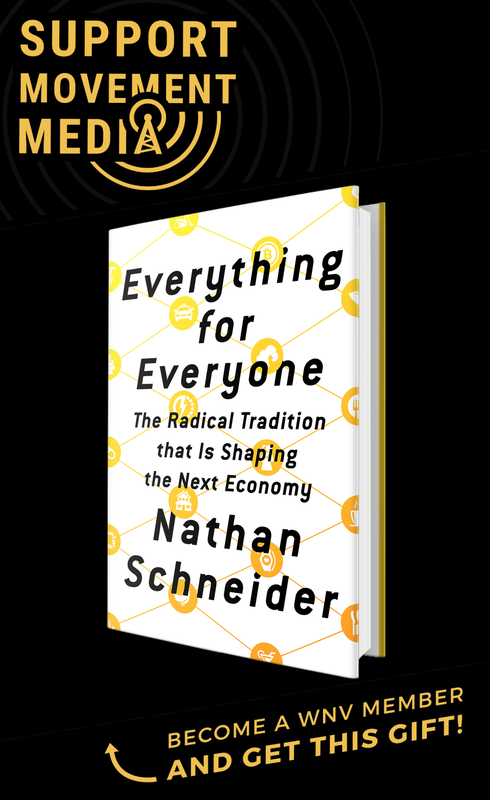 While such actions may seem like a far cry from the kind of massive youth movement that erupted in Egypt’s Tahrir Square and other parts of the world in recent years, they are important first steps toward one, particularly for a country with a pervasive culture of fear. Most citizens of Uganda are deterred by the many reports of torture and disappearances, but witnessing youths operating under extremely repressive conditions has encouraged others to exercise their right to peaceful demonstration. After years of relative political idleness, the young people of Uganda are now on the national radar every few weeks, plotting symbolic pranks that continue to frustrate a long-standing regime. While a diversity of nonviolent tactics is necessary to achieve any significant social or political goal, one thing is clear: their approach has been contagious. Not only the youth of Uganda have been suffocated and frustrated by the greedy NRM politicians, all sections of the populace have been frustrated by the greed of these so-called politicians. They have stooped so low soliciting for bribes from the “strongman” every time an opportunity to do so crops up; all at the expense of the vulnerable masses. All they have done is make sure he doesn’t get out power, for they feel letting him out, means the end of their existence politically and otherwise. The youth are right to vent their anger in whichever way possible. Perhaps, this will make the strongman and his cronies “the greedy lot” realize that being selfish hurts others. As a Ugandan, I must say I have not seen any political leader that has consistently worked to improve the employment situation in the country as has President Museveni. While his opponents are busy demonizing him and sabotaging economic projects such as was the case with the construction of Bujagali Hydro Power Project, he is busy traversing the world for foreign investors, constructing dams, road networks, building health centers, providing Universal (free) Primary Education (UPE) and USE, ensuring peace and stability and educating people especially in rural areas on how to improve their fortunes through better farming methods. While it is easy to talk of “torture and disappearances” to an outside audience, those of us within Uganda know a totally different story especially if one has lived long enough to compare the current situation with that which prevailed during the Obote and Amin regimes. It is also noteworthy that the author of the article who is writing about a “brutal regime” does so living comfortably with his family within Uganda’s boundaries. The likes of Kikomeko ‘re some of the sycophants that maintained this regime in power.For instance the constructions that are over praised is money got in form of loans and grants that will be paid by even our great great grand children. There fore i’m sick and tired of such cheap politics over and again.